Be ready for anything with these smart trainers. Whether you’re going for a casual drink or a more special evening out, these trainers will become your go-to. They’re simple and smart, making them a great partner for almost any outfit. 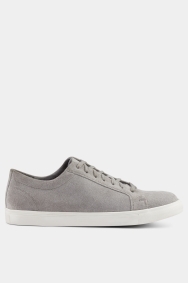 The grey suede brings both style and comfort thanks to their softness. Be brave and pair these with a sharp suit and a t-shirt, but feel free to keep things simple with your jeans. Good quality leather, but the appearance and and lining quality looks a bit poor.